Most Irvine voters — Republicans, Democrats and Independents — agree on one thing: Big money plays too big a role in our local politics. This is especially true when it comes to multi-million-dollar land-use and development issues. The sad fact is that too many local elected officials in Orange County — and here in Irvine — are beholden to special interests. Unfortunately, these politicians are less interested in serving the public than in serving big developers, who then fund their political campaigns. It’s no wonder people everywhere are cynical about politics and the corrosive influence of big money in our civic affairs. But, as I remind myself and others, it’s important to recall that big money doesn’t always win. From time to time, we’ve proven that in Irvine, with our victories on open space preservation and defeating the County’s plans to put an international airport in Irvine. If enough people pay attention and really care about an issue, we can win. We can, for example, control growth and development and make decisions for our community that reflect the will of the people and not what multi-billion-dollar developers and their servants on the City Council want. 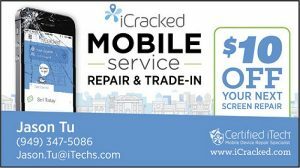 This proposition is about to be tested again here in Irvine. Thanks to the commitment and hard work of hundreds of civic-minded Irvine citizens, and thanks to the nearly 20,000 Irvine residents who signed the recent Referendum Petition, the people of Irvine will have a critically important opportunity in this election year. 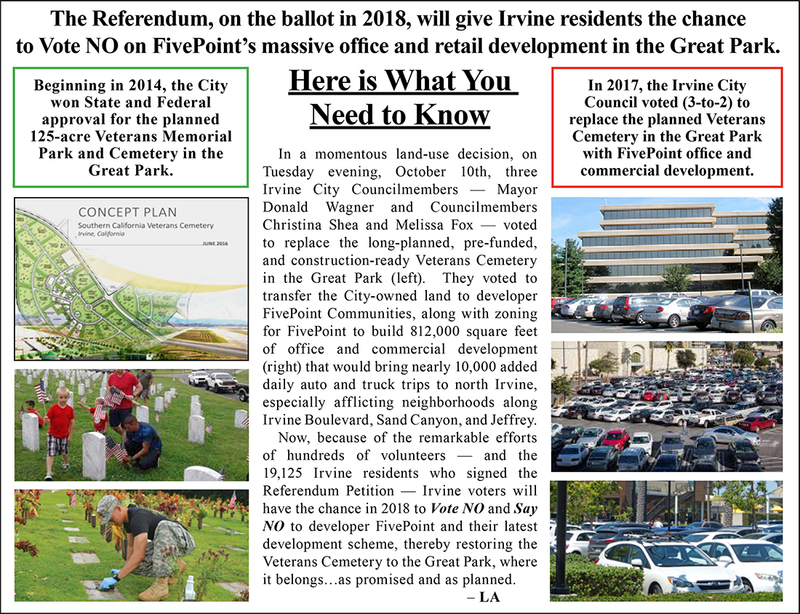 Irvine voters can say NO to the very unpopular City Council decision to replace the Veterans Cemetery in the Great Park and rezone the site for massive office and commercial development that will further enrich developer FivePoint Communities with hundreds of millions of dollars in windfall profits. With as much as $500 million or more at stake for FivePoint, you can be sure they will spend millions on a torrent of campaign materials to mislead and confuse voters in order to get their way. I’ll write more about all that later. But, for now, just remember this: At the moment that you and your neighbors cast your ballots — you are more powerful than any big developer because, in our local democracy, you still have the power to say NO by voting NO. And when that happens, the people win. Irvine wins.